How to get fit – FAST – in the shortest possible time – using nothing but your own bodyweight! 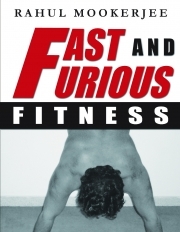 Description of "FAST AND FURIOUS FITNESS"
More folks than ever before are in need of a quick and effective workout. Obesity levels are rising rapidly and alarmingly, and the average person’s overall health is deteriorating at an even faster pace. Most training literature these days refers to lifting weights, but, while effective to a degree, the health benefits obtained by lifting weights cannot compare to those you get by following a bodyweight based program with NATURAL exercises. Fast and Furious Fitness offers workouts based upon natural, bodyweight movements that promote superb overall health and a robust physical outlook. More importantly, the varieties and progressions on offer ensure you constantly have goals to aim for, and never get tired of doing the same routine over and over again. But don’t just believe me - look at the way elite sportsmen around the world train. Let’s take three of the strongest and most well conditioned categories of athletes: sprinters, boxers and wrestlers; ALL of them use bodyweight movements as the bedrock for their routines. And the results speak for themselves. Make up your mind right now to train like an athlete, using natural exercises that promote superb overall health. Don’t waste hours pounding the treadmill, and don’t waste time on long and drawn out weight lifting sessions. Instead, train the FAST AND FURIOUS way; you will quickly discover that exercise sessions should be just that – FAST, AND FURIOUS! Fitness has always been a passion with Rahul Mookerjee. He is an avid trekker (especially when it comes to climbing hills! ), swimmer and workout maniac. He has always been on the lookout for new and more effective workout routines that can be performed by the average individual. In doing so, he has discovered the combinations of exercises that work the best - and that is what is being shared through this book. Rahul has also helped many a person improve their levels of fitness by advising them on how to perform a certain exercise, or how to improve on what they are already doing well. Rahul owns and operates his own fitness related venture at www.rahulmookerjee.com. He can be contacted by email at info@rahulmookerjee.com. Reviews of "FAST AND FURIOUS FITNESS"